Located in the heart of King’s Cross with beautiful views over Regent’s Canal, the venue is easily accessible from all over the UK and Europe. It’s no surprise the environmentally-focused building was named the UK’s ‘Best of the Best’. 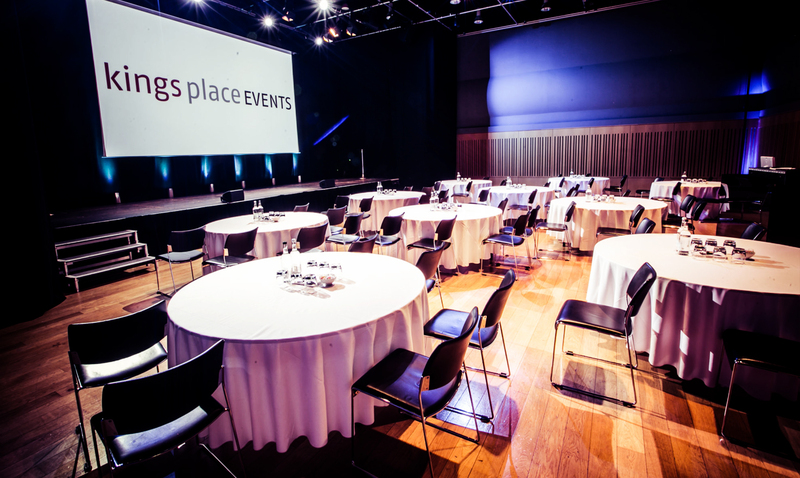 Opened in 2008, Kings Place has established itself as an award-winning conference and events space providing all catering, AV and production services in-house for a variety of events from a large scale team building events and conference to drinks receptions, boardroom meetings, private dinners and Christmas parties. The revenue generated from venue hire under the Kings Place Events brand also contributes to the Kings Place artistic programme, a real bonus for teams wanting to “do their bit”. Hall One is a stunning auditorium with tiered seating for up 420 people, perfect for our iPad Movie Making Experience as the auditorium is brilliant for movie screenings. Hall Two is the second auditoria at King’s Place. This room has been designed to accommodate events which need a high degree of flexibility in terms of layout and technical production. In additional to a plethora of other rooms there is the “Battlebridge Room”, one of our favourites. This beautiful waterside room has its own covered terrace, perfect for team building and parties. All catering is provided in-house by Green & Fortune, a company dedicated to a ‘gate to plate’ ethos as beef and lamb is sourced from their own farm in Northumberland, where animals are traditionally hand-reared and grass-fed. Ideal for: Stocks in the City, Mixology, The Ultimate Team Build, Get in the Zone, The Killing, Awakening the Dead, Real Life Clu’Doo, Escape the Box, No Ordinary Quiz, Christmas Parties and much more!